Jose Cuervo is produced by Tequila Cuervo La Rojeña. 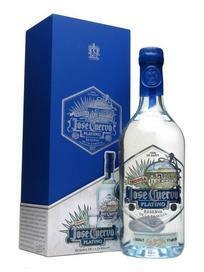 According to the company, Jose Cuervo, in 1795, was the first producer of tequila in the world. As of April 2012, it is the largest selling tequila brand in the world, with a 19 per cent volume share of the global market. In 1758, Antonio de Cuervo received a land grant from King Ferdinand VI to start an agave farm in the Jalisco region of Mexico. He built a small factory on this land, and in 1795, King Carlos IV granted the Cuervo family the first license to commercially make tequila, so they built a larger factory. They started packaging their wares in individual bottles in 1880. The distillery was named Fabrica La Rojeña, but in 1900, Jose Cuervo Labastida decided to brand the tequila as Jose Cuervo. The company is now owned and run by heirs of the Cuervo family, the Beckmann family, who also own the brand 1800 Tequila, among others. Gold/ amber colour. Elegant, sweet floral nose with a hint of black pepper. The palate is dry, relatively light, displaying dried fruits, vanilla oak and a peppery spice warmth. Warm, balanced spirit finish. A versatile all rounder. 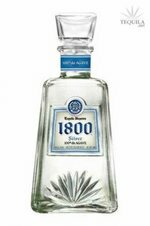 1800 Silver is 100% Agave Tequila and has an exceptionally clean, silky smooth taste. Clear with a faint straw hue. Mild, canned pineapple, roasted pepper, herb soap, and vapor aromas. A buoyant entry leads to a round dryish medium-bodied palate with mild fruit preserves on toast, spice, and white pepper flavors. Finishes with a prickly fade of pumpkin pie and pepper. Gold colour with a copper hue. The nose displays a combination of herbaceous agave, apples, figs and mellow oak. Bold, round mouthfeel. The palate is smooth, slightly sweet with powerful spirit, followed by a pungent backdrop of earth, spice and oak. Very warm spirit power wave finishing rich and spicy.
" The initial aroma is of black pepper and steamed broccoli. Following aeration, a bouquet of succulent scents of Brazil nuts, egg cream and light oak resin appear. An oily flavor of bacon is apparent at palate entry; at midpalate the pepper returns with added tastes of spinach, sage and butter. Finishes elegantly yet zestily as the pepper comes to the fore." Caramel coloured. The first whiffs reveal plump, toffee-caramel notes underpinned by an asparagus-like agave aroma; aeration unearths nuances of fennel, white pepper, sage and rosemary—a complex and engaging bouquet. Palate entry is vegetal, green and off-dry; at midpalate the flavor profile turns sweet and sour, fruity and oaky. Concludes on a bittersweet note that somehow closes the circle on the journey. This is a limited-edition spirit presented in numbered bottles. It is handcrafted using the company's proprietary process called "Esencia de Agave," during which the steam is recaptured and, with it, the flavor essences of the plant. It then is chill filtered. The result is a stunningly smooth, creamy tequila best enjoyed straight and at room temperature. None of that ice-diluted business that one sometimes needs with lower-end tequilas to mask any harshness. The agave aroma mixes in the nose with slightly vegetal notes, inviting the imbiber in to experience elements of dried apricot and floral notes, followed by warm nuances of lemon zest, rose petals and a touch of pepper. Aged in oak barrels for an average of 3 years. Final blend includes Tequila from reserves aged over 30 years. Only the estate’s finest 10-year-old agaves are hand-selected. Only the most flavorful inner portion of the agave’s piña is used. 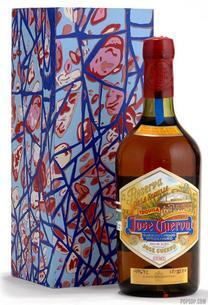 Vibrant, with a full, mellow flavor, combines floral, agave, vanilla and Cognac-like flavors. Reserva de la Familia is the Cuervo family's finest Tequila. It is often served in a snifter, where its complex flavors and aromas can be fully appreciated. Produced in limited quantities with a distinct personality that varies from year to year, Reserva de la Familia has been recognized with several prestigious awards in Mexico, the United States and Europe.